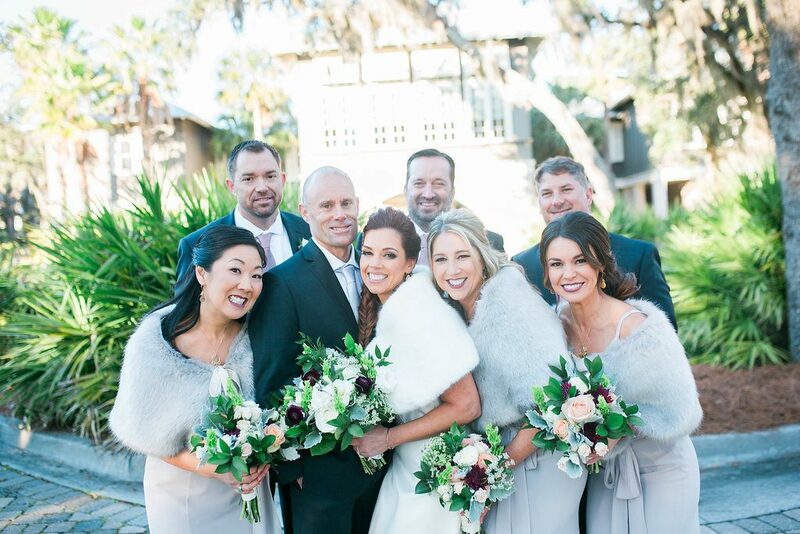 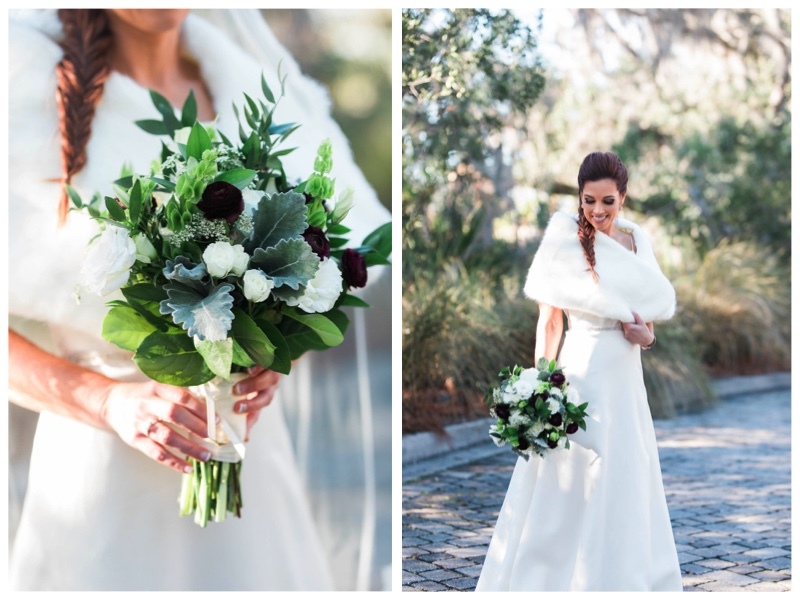 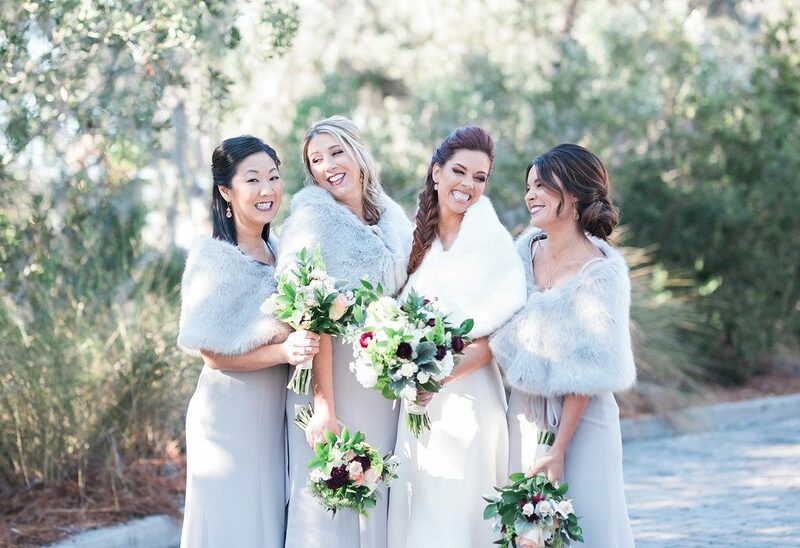 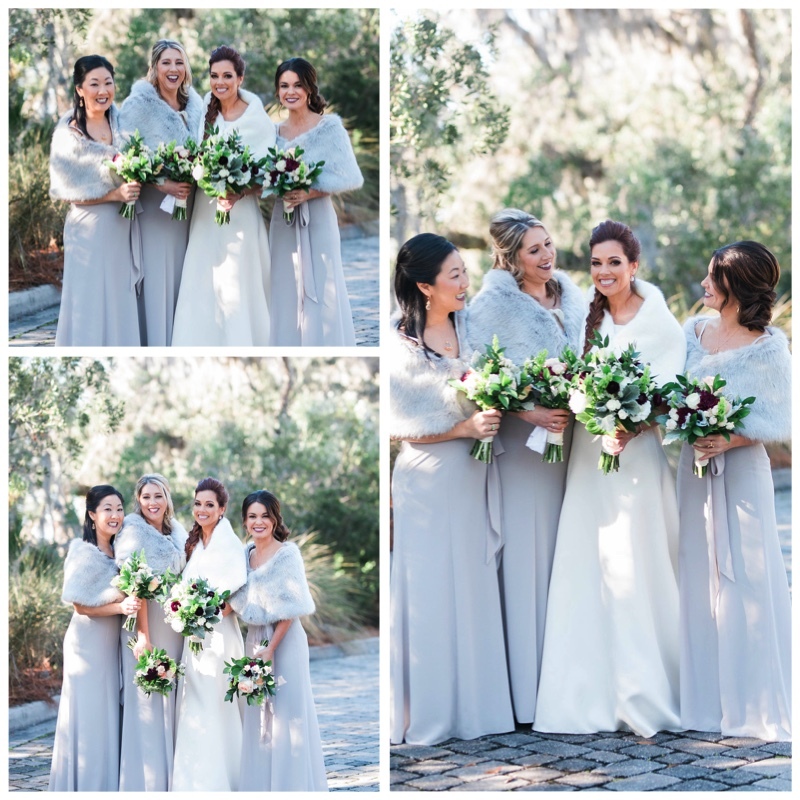 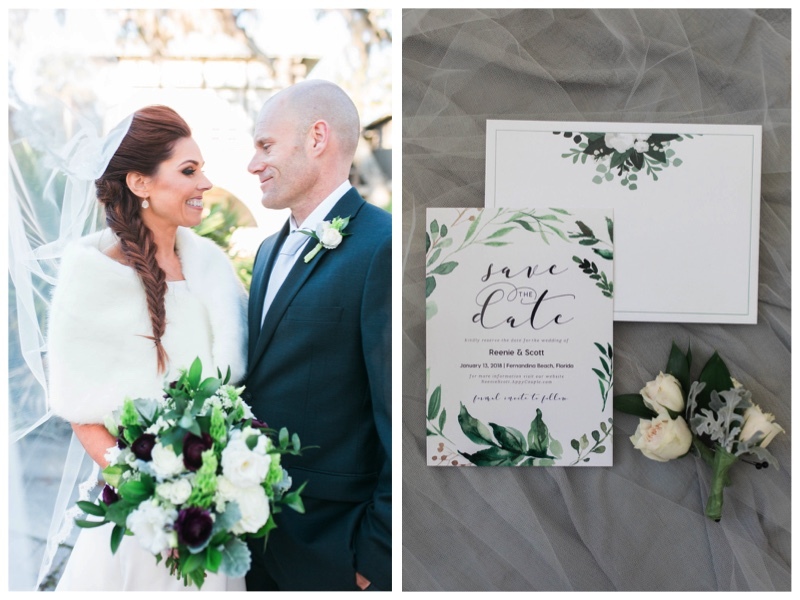 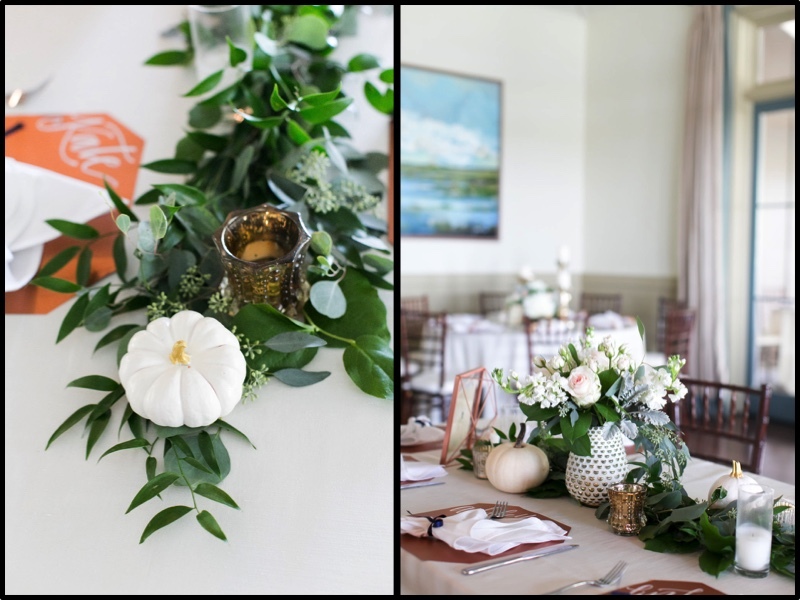 From the furs to the flowers Scott and Reenie had a stunning, earthy winter wedding. 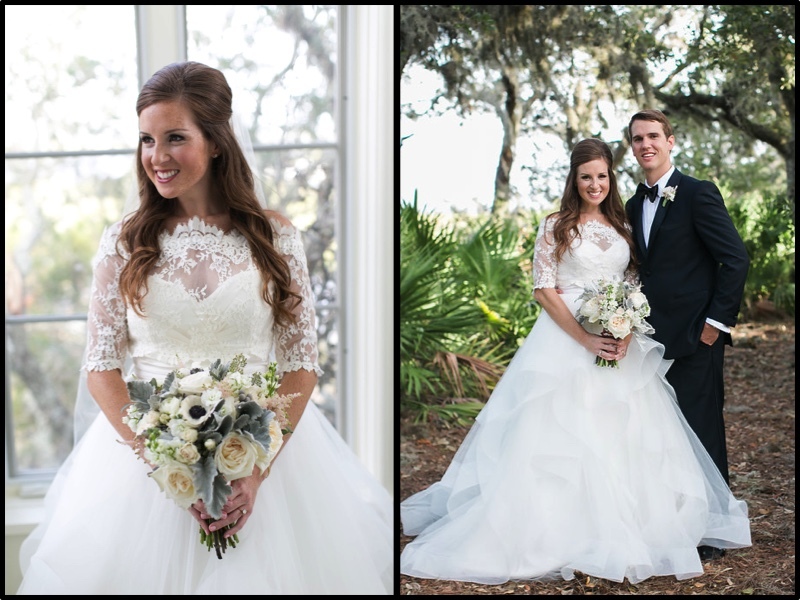 Scott and Reenie are an adorable couple that we loved working with. 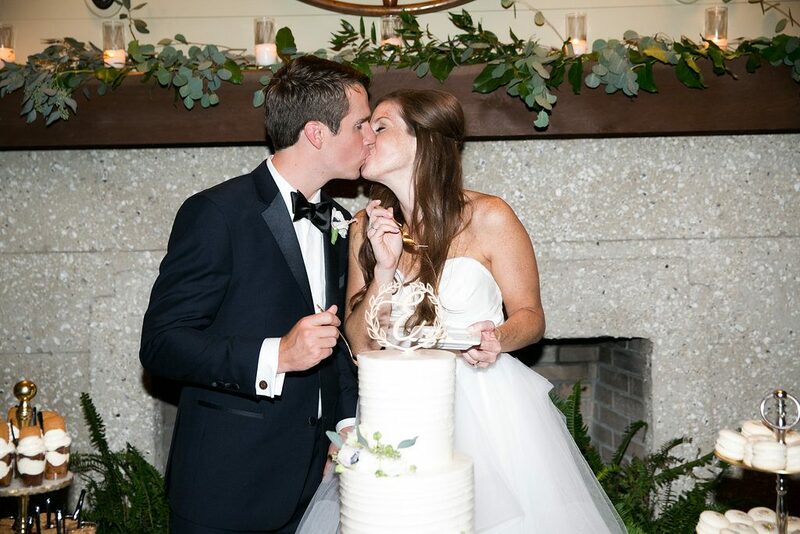 They are both laid back and fun loving. 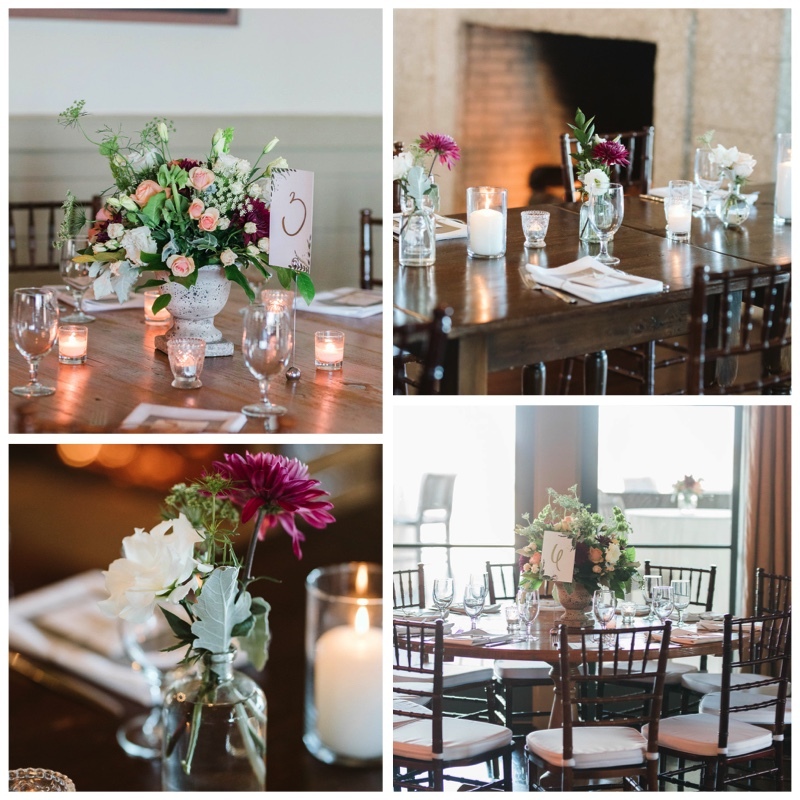 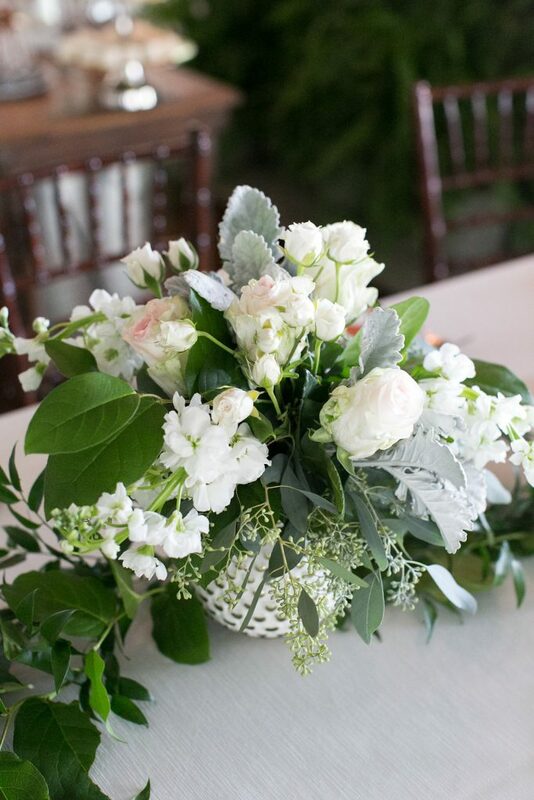 We absolutley loved the simplistic beauty of their wedding flowers. 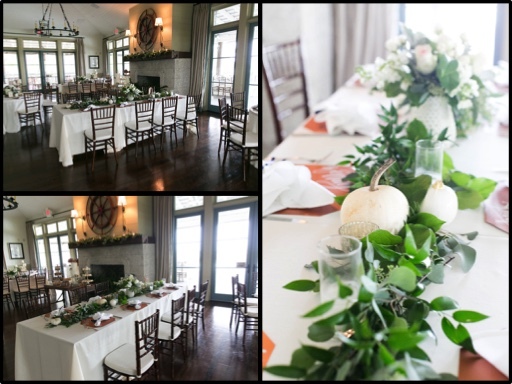 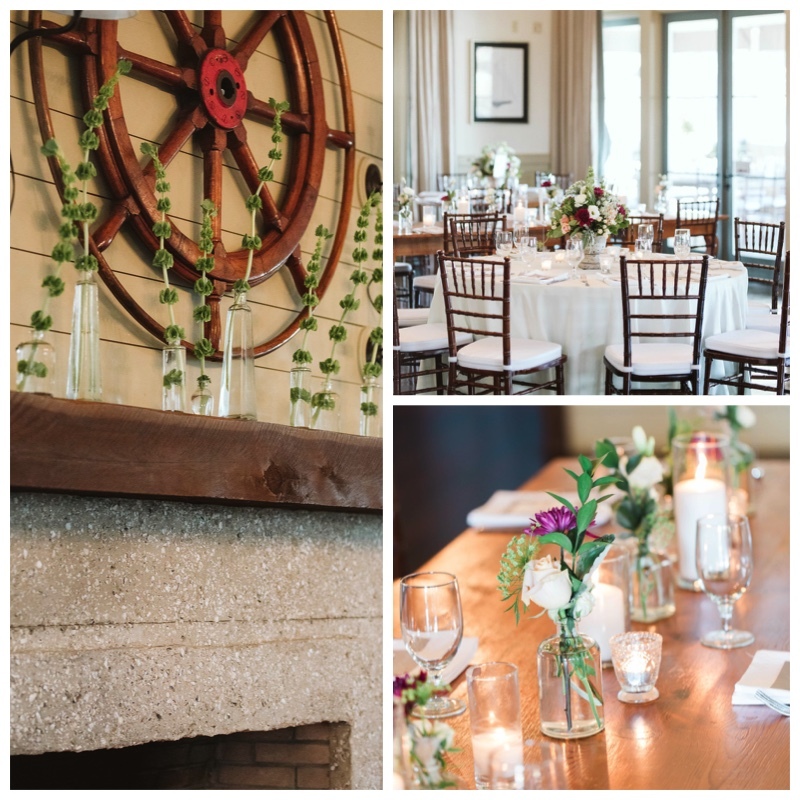 Julie and Jonathan had a beautiful ceremony and reception at Oyster Bay Yacht Club. 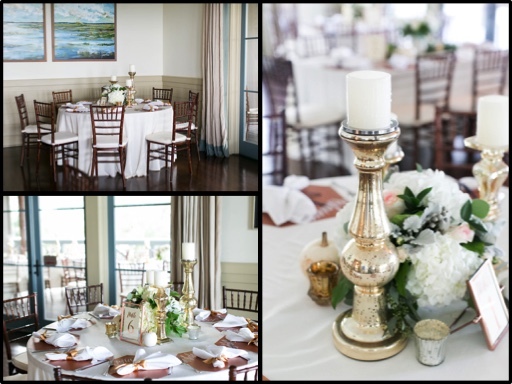 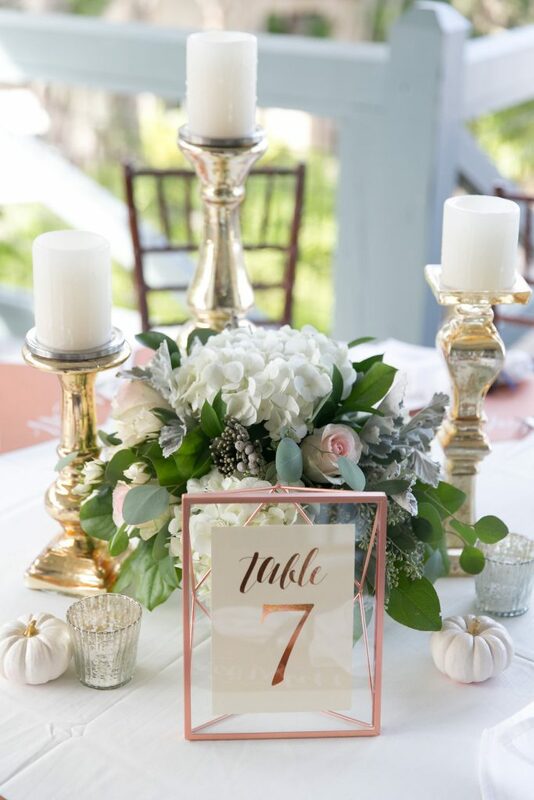 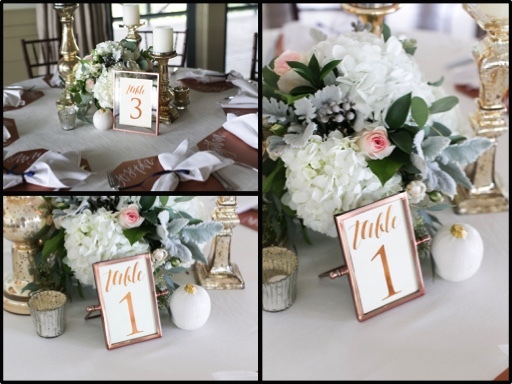 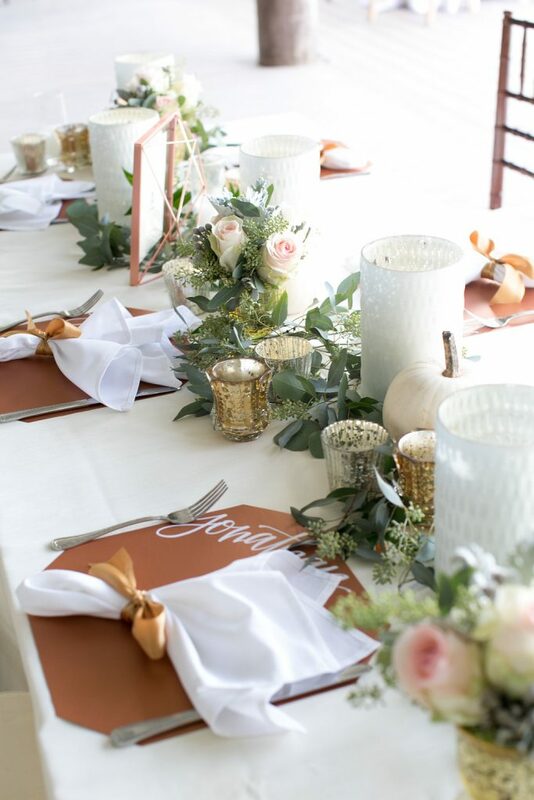 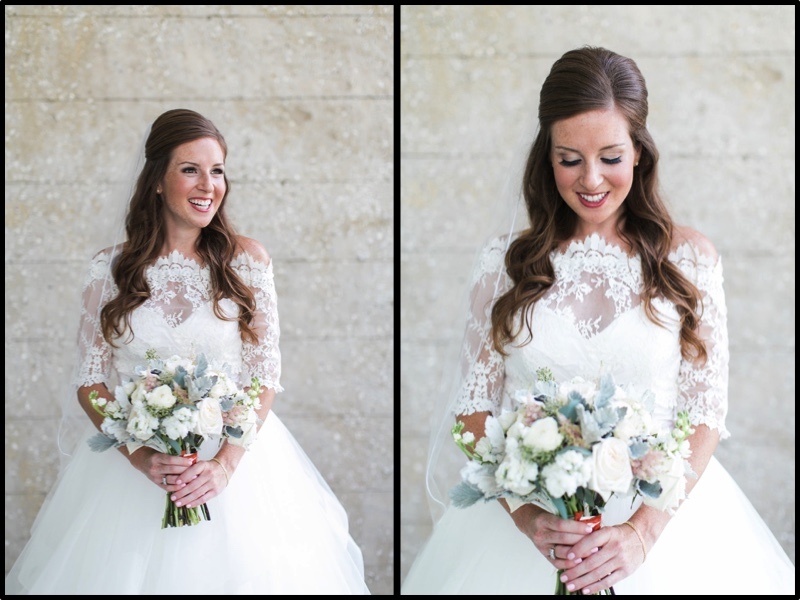 Julie was a pleasure to work with and we loved her vision of mixed metal accents and romantic designs for this fall wedding. 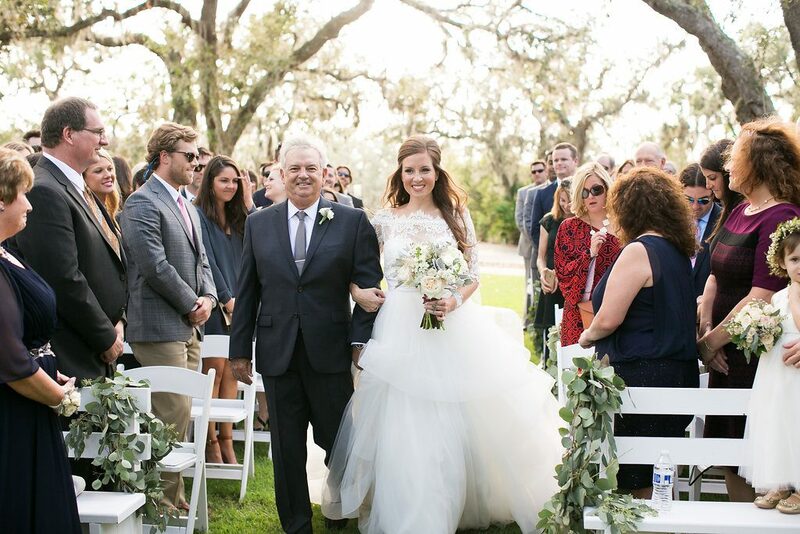 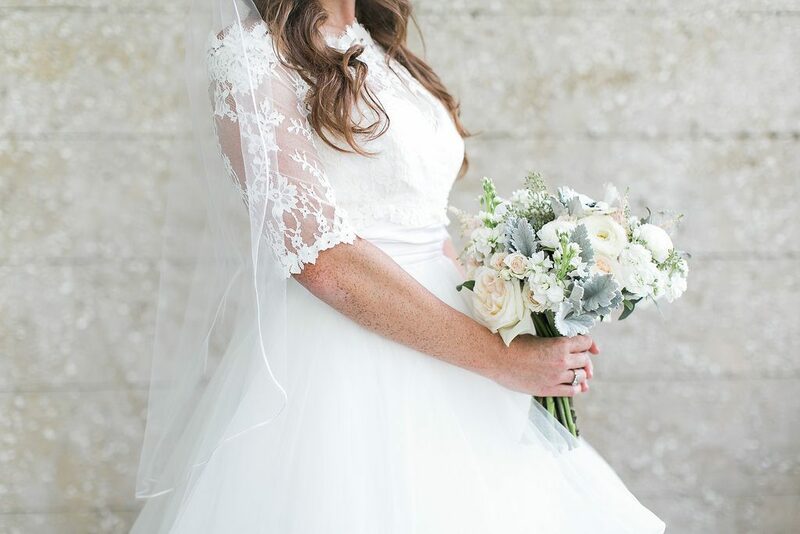 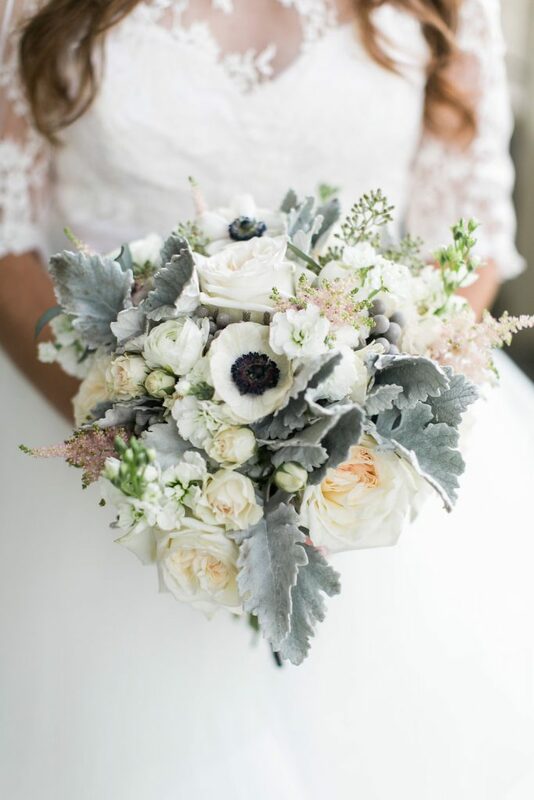 Julie carried a textured bouquet made of blush garden roses, white anemones, white ranunculus, blush spray roses, and brunia with touches of dusty miller, astilbe, seeded eucalyptus and white stock. 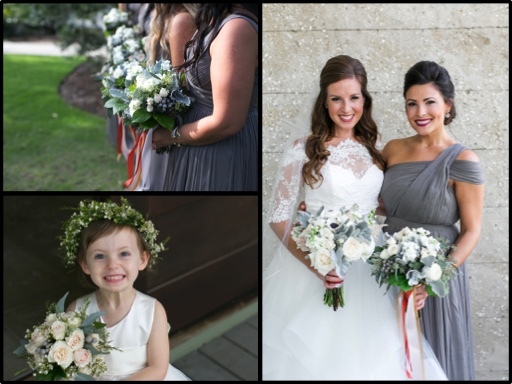 The bridesmaids’ bouquets were the perfect compliment to Julie’s bouquet. 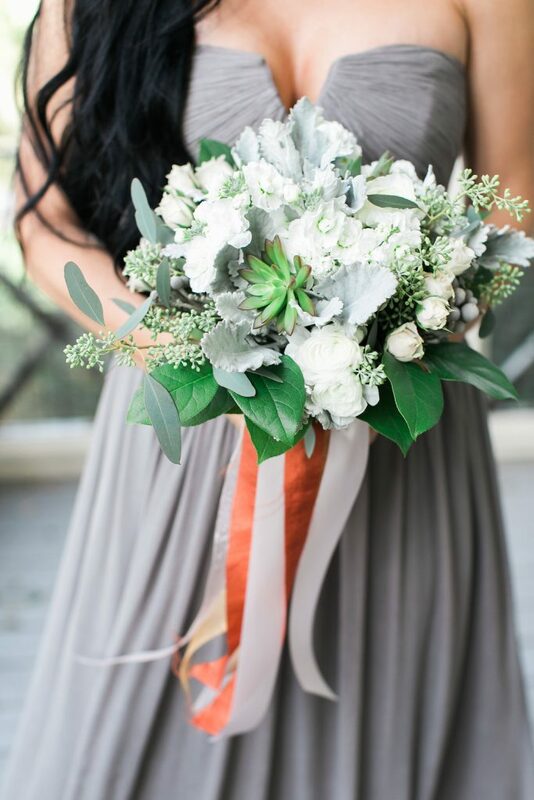 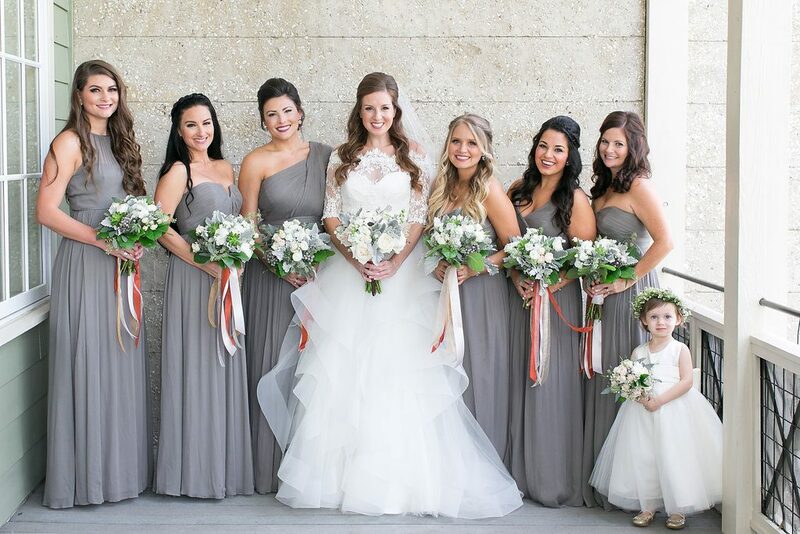 Their bouquets were created with ranunculus, spray roses, stock, succulents, bruin, eucalyptus, and dusty miller. 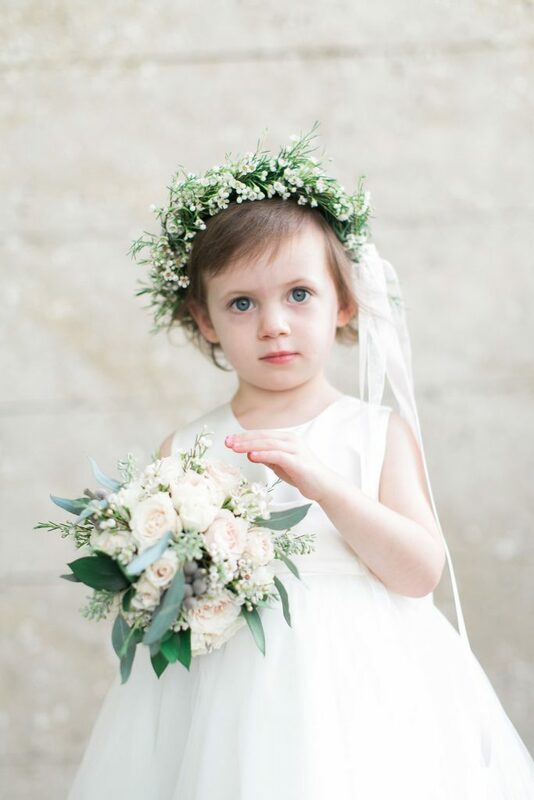 The flower girl wore a crown of wax flowers and carried a wand of spray roses and wax flowers. 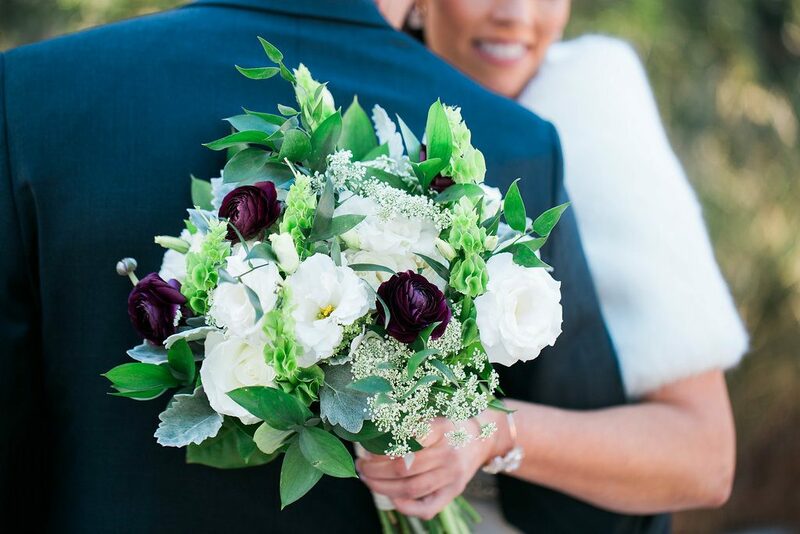 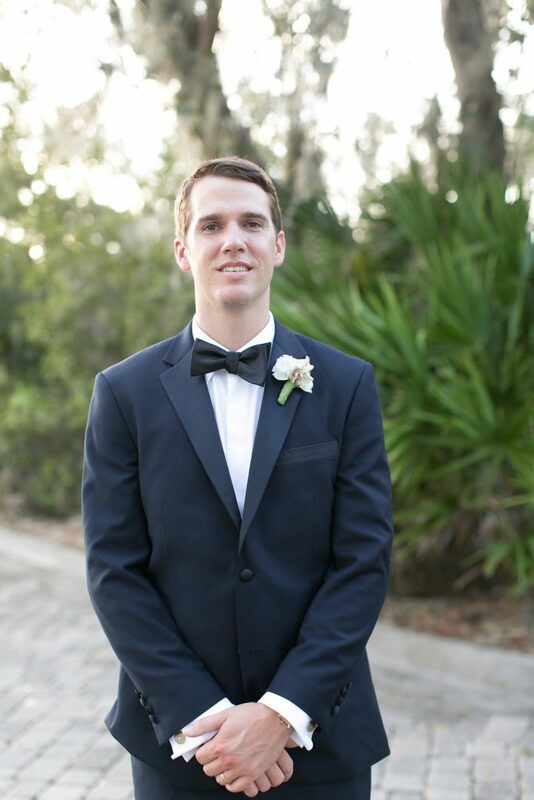 Jonathan’s boutonniere was a white anemone, dusty miller, and astilbe. 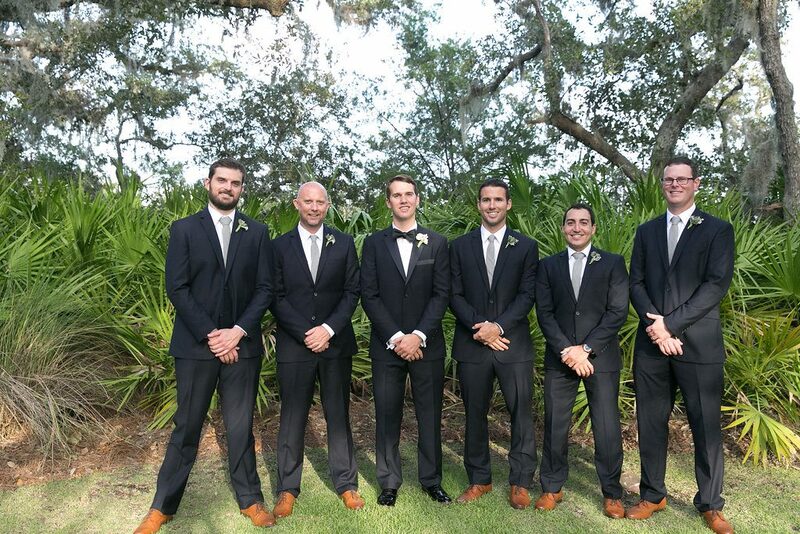 The groomsmen wore ones made of succelents and dusty miller. 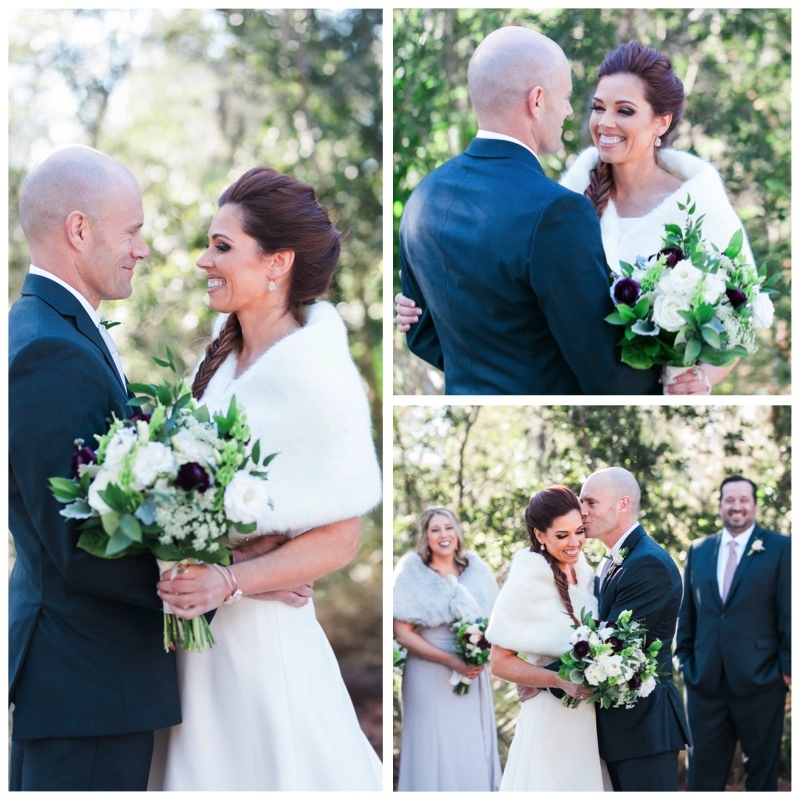 Jonathan and Julie had a very simple yet lovely outside ceremony. 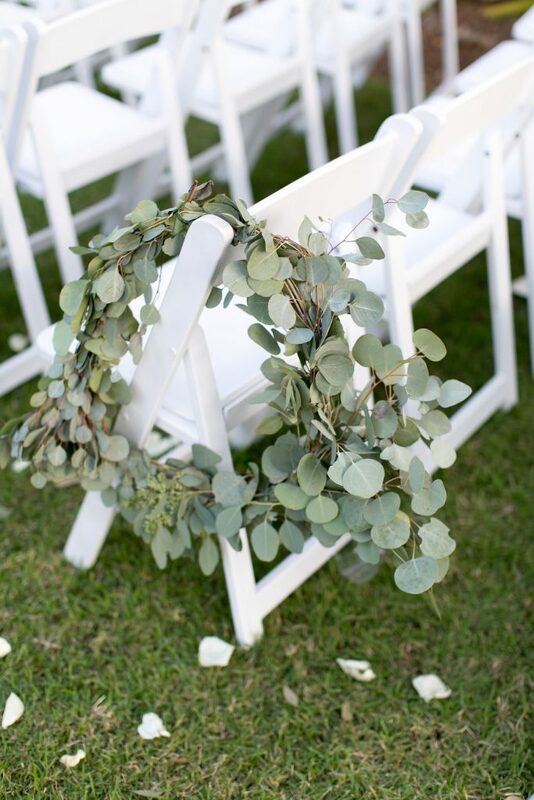 The aisle markers were eucalyptus wreaths. 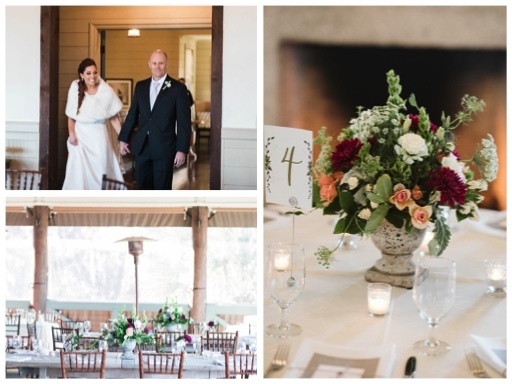 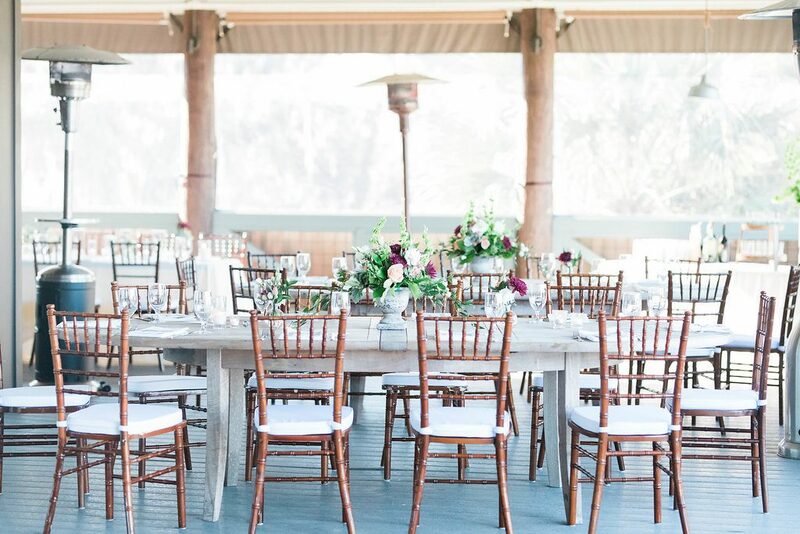 After saying “Ido” Jonathan and Julie had a stunning, romantic reception. 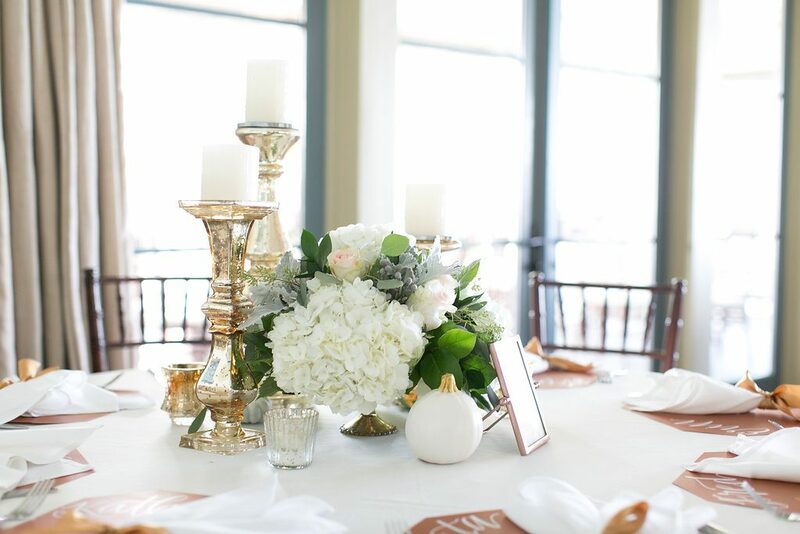 The feasting table had vases that held the bridesmaids bouquets with loose greenery placed among the vases. 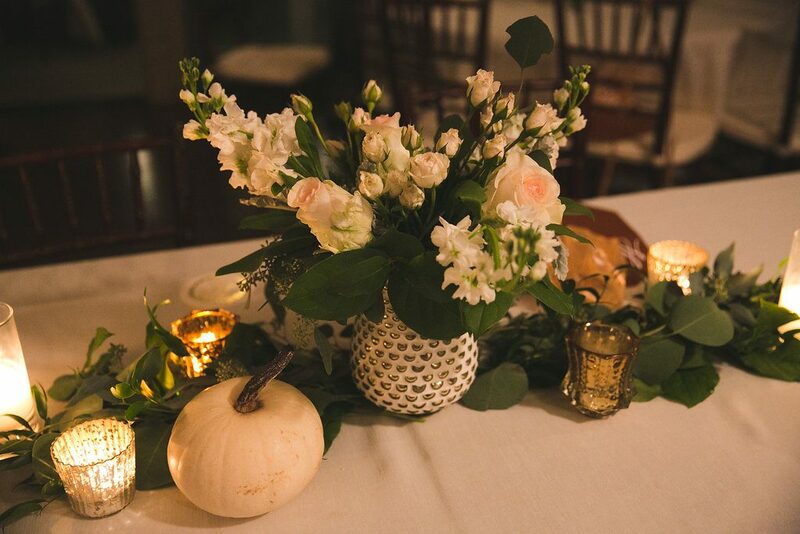 The table also included eclectic groupings of candles and small urns with flowers. 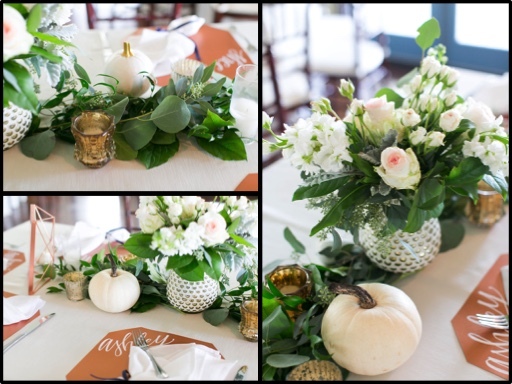 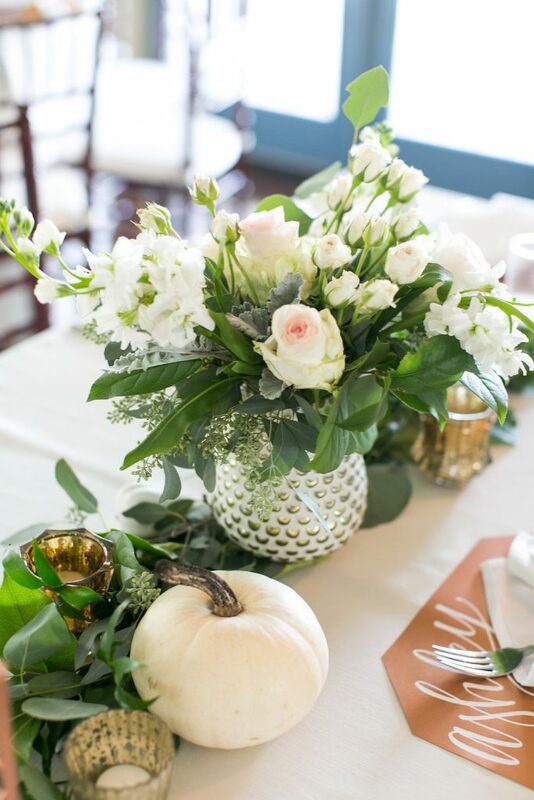 There were also white pumpkins scattered amond the vases and candles to add to the fall atmosphere. 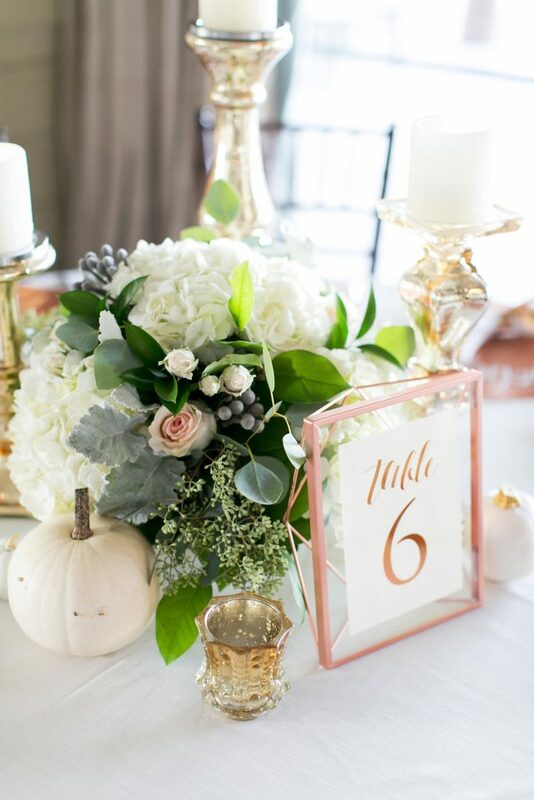 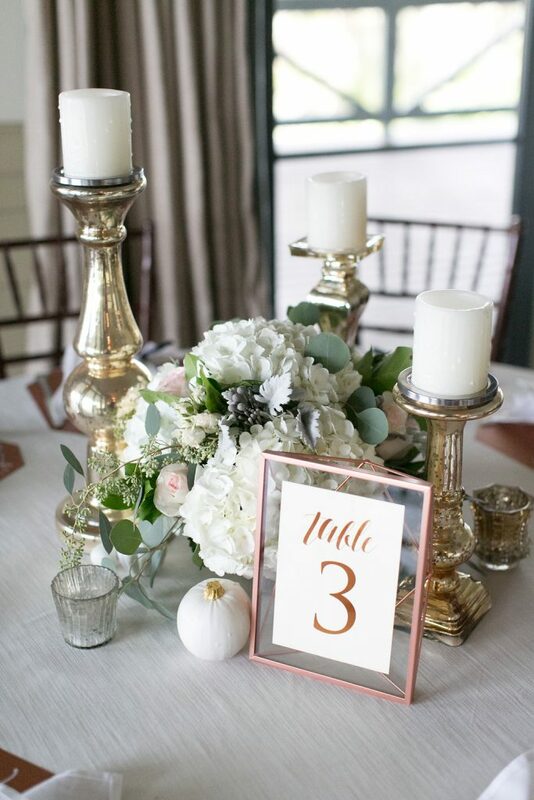 On the banquet tables were white and gold vases with arangments of blush flowers with accents of white flowers. 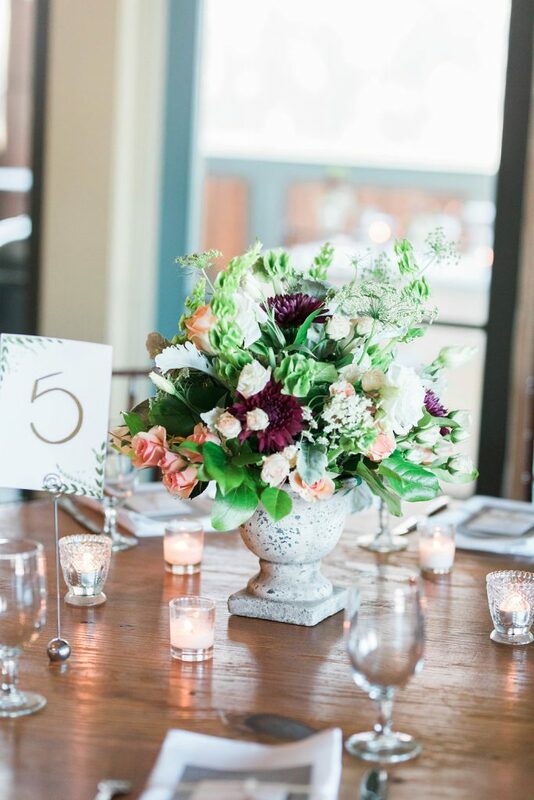 Greenery trailed on both sides of the vases. 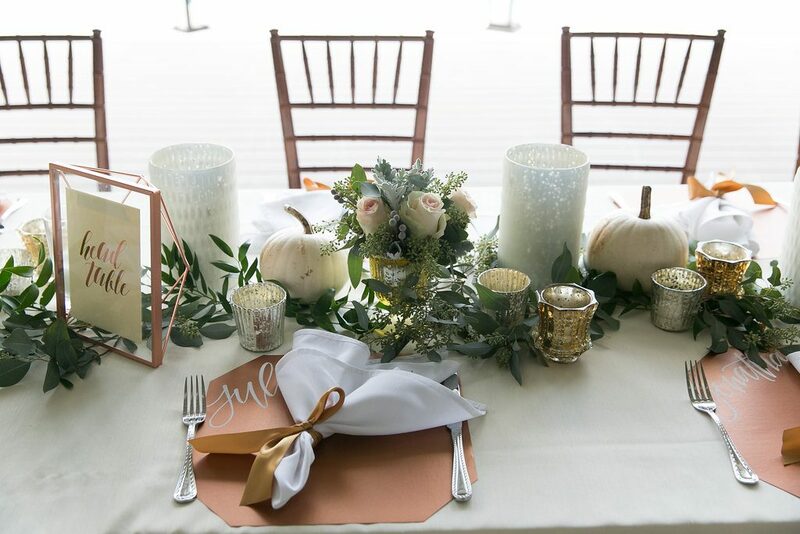 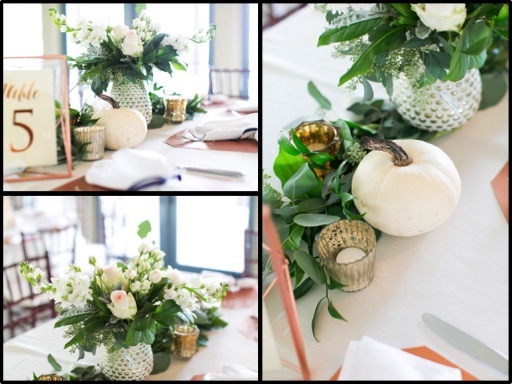 An eclectic mix of candles and white pumpkins were mixed in the greenery. 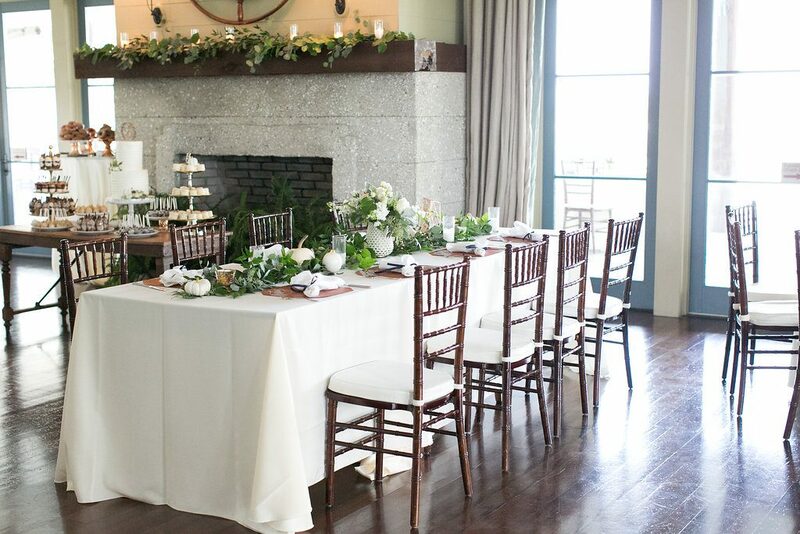 The round and oval tables were just as unique and stunning as the feasting and banquet tables. 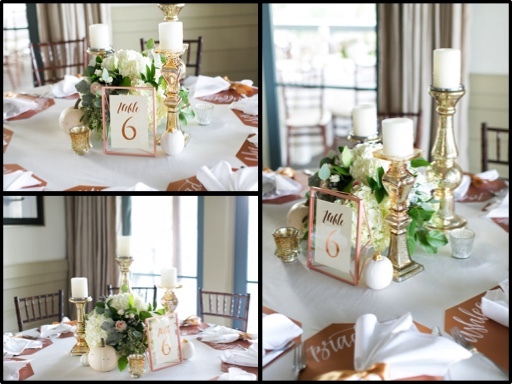 In the center of the table were varrying height gold mercury pilar candles holders. 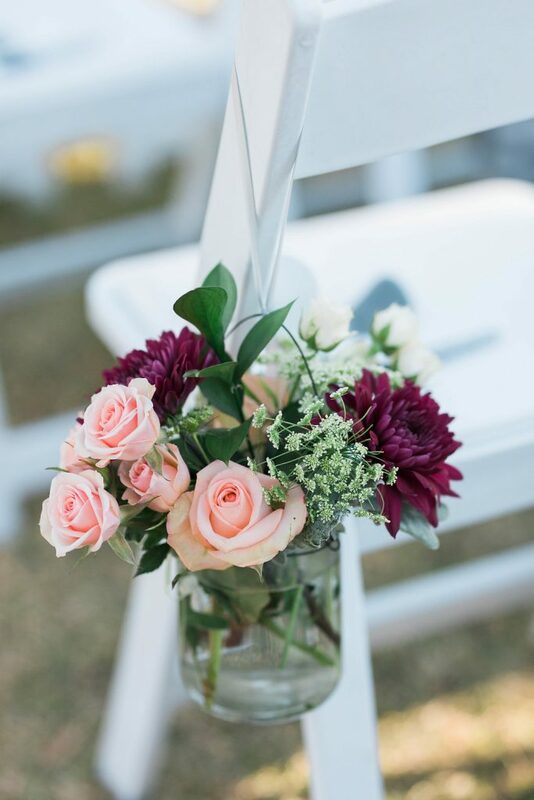 An arrangement of complimenting flowers were created on a pedestal stand. 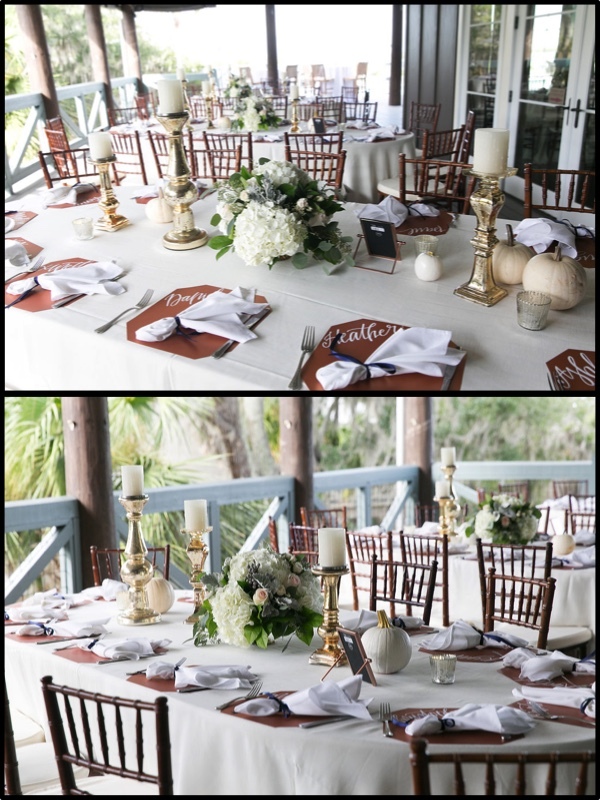 Each table also had eclectic candles which added to the romantic atmosphere. 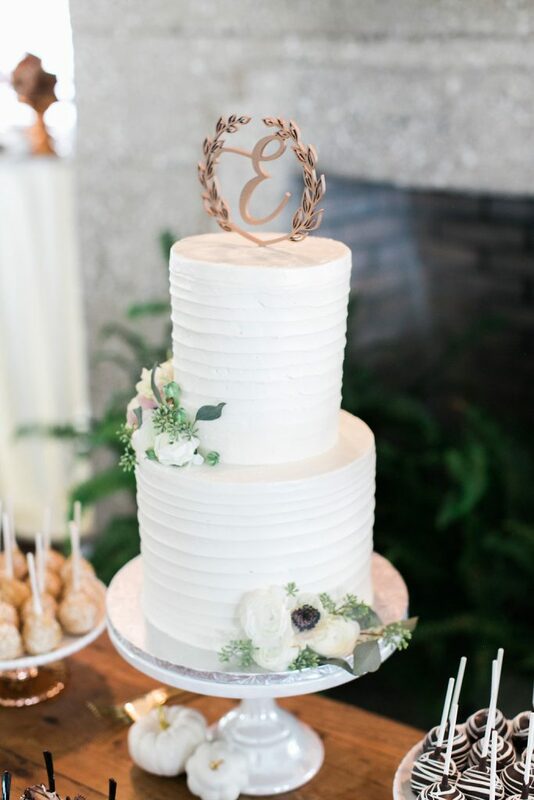 The cake was adorned with a few blooms of anemones and ranunculus. 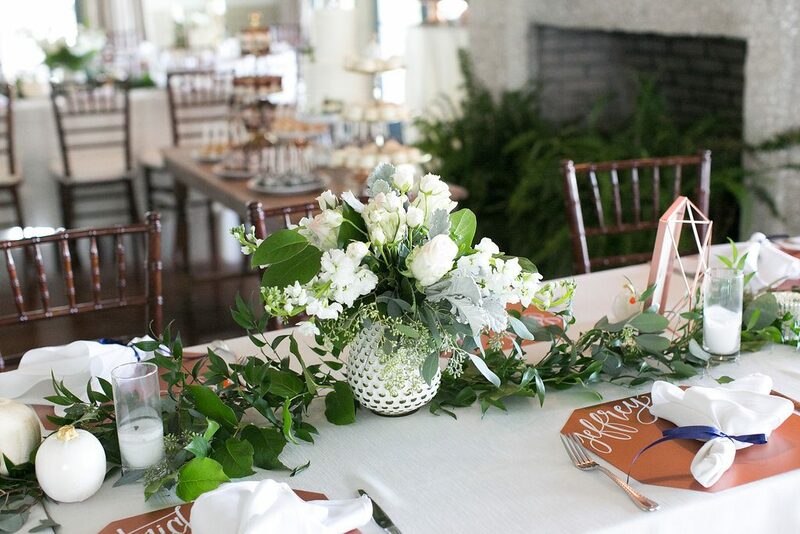 The mantle behind the cake was decorated with mixed foliage and candles.